In many ways process of sending holiday cards has become an impersonal well-oiled machine that can all be accomplished in one simple online transaction. A third party can take care of everything, making it so that the sender does not even need to lay a hand on the card itself, rendering the timeless tradition devoid of its magic, nostalgia, and meaning. By sending cards with pre-printed messages, signatures and envelopes, we are missing the real reason behind the season’s most popular tradition. We’d like to get back to a time when sending holiday cards is not looked at as an obligation, but rather an opportunity to demonstrate that we sincerely care. There is something to be said for the tactile pleasure elicited from hand-crafted letterpress cards printed on the awesomeness known as cotton rag paper. But don’t just stop there–consider taking it to the next level by blinging it out with the shine of metallics or adding a special touch like luxe a velvet-lined envelope or a rustic wood veneer backer. Call us biased, but sending a designer card is like sending a miniature work of art. Who knows, they may even want to frame it and keep it out all year long. There is nothing quite like opening a card that is embellished with a hand-written greeting. Though time is something we are all short on during the Holiday Season, this year, take a night or two, sitting in front of your favorite holiday movie (ours is Elf) and sign your name to you cards along with a personalized message. The note doesn’t have to be a long one, but since this card may be the only time you engage with people on your list all year (not counting Facebook likes), your holiday card is the time to say something special, whether it is “I’ve been thinking of you,” or something more personal that pertains to your particular relationship. Tip & Warning: Spiked eggnog can make the night of signing more fun, but don’t overdo it so as not to risk misspellings and messy handwriting. Clever one-liners like, “Happy Everything,” are always fun, but why not take the opportunity to create a witty rhyme or personal sentimental wish that will really resonate with your friends and family. Think of it as making a meaningful toast with your holiday card. Speaking of a meaningful toast, with our Holiday Toast card for example, you can either use the message pictured above or come up with your own heartwarming message of love and good cheer. Thanks to Facebook and Instagram, we get to see all our friends’ and acquaintances’ kids on a daily basis (sometimes hourly, but there’s no judgment here), so rather than inundating friends and family with more photos, go for a classic or snazzy holiday image instead. 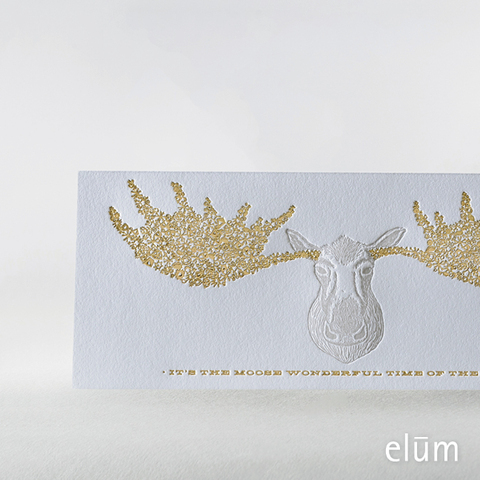 Cards with clever images and captions, like our Bejeweled, “It’s the moose wonderful time of the year” card, complete with gold foil and a creatively unexpected message, will stand out among the masses. 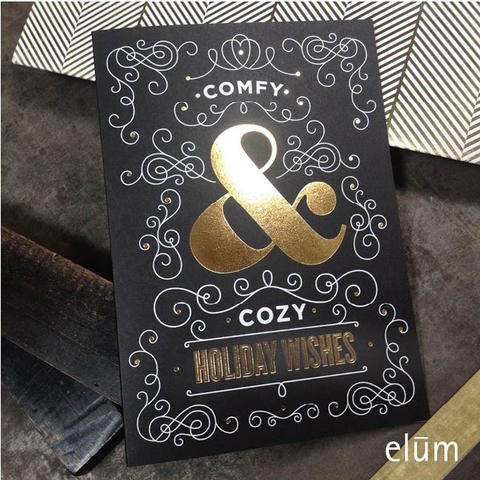 Elūm Letterpress Holiday Cards range from sassy to sophisticated, playful to nostalgic. 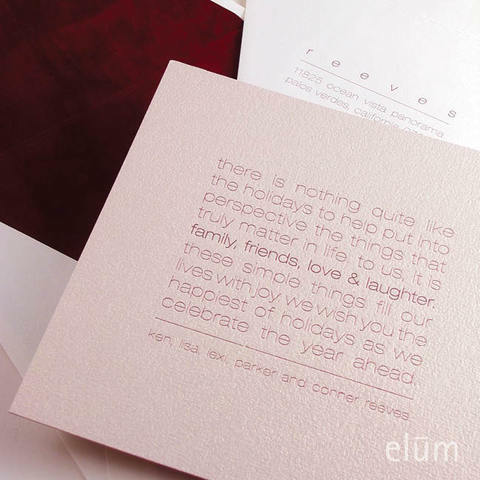 Our holiday line can be found at Papyrus and other fine stationery stores as well as our website. Choose from single cards or boxed sets and spread some memorable, meaningful holiday cheer this year.